Yesterday morning, Mom assessing my cosmetics on her bathroom vanity: “What are you doing with all that stuff?” She doesn’t wait for an answer. “I wouldn’t know what to do with it all,” see adds as she eyes my jars of moisturizer, foundation, concealer, makeup remover. Mother has a smooth complexion for her age—genes or good eating, maybe a combination of both. She is definitely a foodie, always has been. After eating a breakfast of Honey Nut Cheerios, juice, a banana and coffee, she asks, “Do we need a piece of chocolate now?” as she opens the box of confections from NaNa’s Homemade Sweet Treats in E-Town. Our last chore together this PA visit is to wash the jars for canning in her basement cellar—Except for a few vintage jars, she’s giving most of them away because as she nears 95, she’s says, “I’m done with canning.” The jars filled with tomato juice, beets, peaches, apricots, pickled cantaloupe, strawberry jam, and pickles were simply beautiful as they lined her wooden shelves each season. There were even green beans before she had a freezer. Every year, her mother-in-law Fannie helped her chop an array of fresh vegetables for piccalilli, or what the PA Dutch call chow-chow. 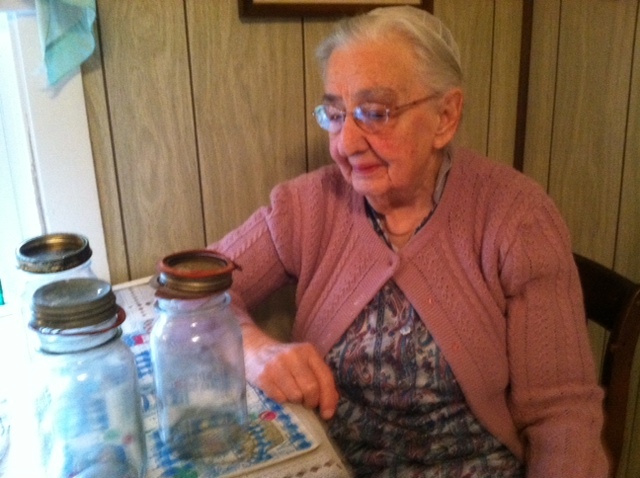 Now she’s donating most of the jars to Goodwill, but keeping a few vintage Ball and Mason Jars. A few have metal clasps that hug the glass lids. All the cliches come to mind here: Beauty is where you find it. Beauty is in the eye of the beholder. You’re beautiful inside and out. What memories of canning, long ago or recent, do you have? Share your story! I’m using the arch cellar, the place where we stored our canned goods, in all their beautiful array of color, as a major metaphor in my memoir, Marian. Lancaster County farm life is filled with beauty. Much of it comes from the fields of green and gold and from well-tended lawns, flower beds, and gardens. From those places, the fruits glow with an inner light. Some of that light remains in the Mason jars, forming a rainbow inside the deepest part of the house. I understand the brain likes color, and we can provide a lot of it in our writing. Thanks for your comment and looking forward to that book! 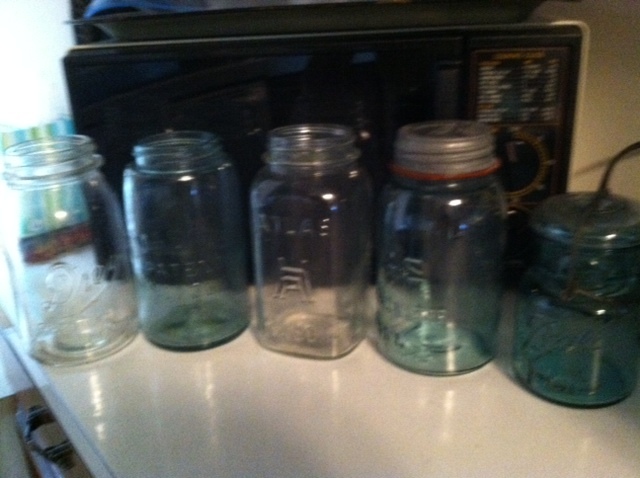 The MCC Reuse It Shop woman said these are really good sellers as she and 2 men unloaded the jars from my car. Should we take them back? — ha! Well, there are more where those came from. In Sticking Points Anna, worried about her husband getting his hands on her jars of hot banana peppers she’s not sure are safe, hides them on a way-back cupboard shelf until she hits upon a way to dispose of them. It involves a back-hill hike and a hole. Interesting how our life experiences intersect, though not hard to imagine with similar backgrounds. 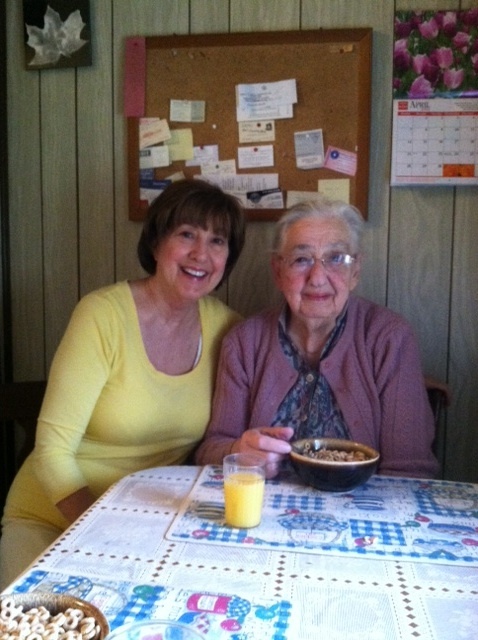 My mother is a simple, contented woman, not afflicted with the analyzing and re-hashing most other souls are prone to. Bless her heart! I’ll have to get my hands on Sticking Points soon. Thanks for the comment, Shirley. You have to love a woman who understands that it’s never too early for chocolate.